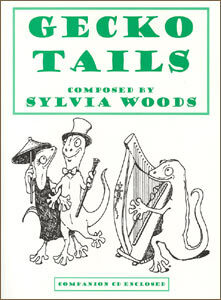 This suite of five original, whimsical compositions by Sylvia Woods was inspired by the cute little geckos that live in most of the houses of Hawaii. With their suction-cup toes, these symbols of good luck climb the walls and dance across the ceiling. Includes Sticky Toes, View from the Ceiling, Dancing in the Waterfalls, Tropical Dreams, and The Gecko Stroll. The pieces are for intermediate harp players, and fingerings are included. There are no lever changes in the middle of any of the pieces. The book is 32 pages. The enclosed companion CD includes the entire 12-minute suite. Want it now? This book is also available as a PDF download, which also includes the audio mp3s of all of the tracks.